The Doughlings were a happy bunch, living life to the full and running round with constant smiles on their faces. That was until a meteor struck their planet, emitting poisonous gasses that made the population ill, turning them into ravenous creatures hungry for blood, before seeing them converted to stone and dropping dead. Planet Doughling was no longer a happy place, but a place of tragedy. Thankfully though, one Doctor Morpheus had a plan; one that involved healing infected Doughlings, and returning the planet back to its former glory. And that is pretty much the entirety of the tale found in Doughlings: Arcade. It’s a simple story that is played out via basic cutscenes before the action kicks on. But don’t let the lack of a proper narrative turn you away, because once you get into that action, it turns into a horrendously addictive time waster. From the blurb, you probably couldn’t guess that Doughlings: Arcade is in fact a brick breaker, and that is another reason why the lack of real story is no issue. It is however true, albeit one in which the bricks have been replaced by squads of infected Doughlings, and the usual bat by that of Doctor Morpheus. Strangely though, it works. Very, very well. Moving Morpheus left and right across the bottom of your screen, the usual brick breaking ideas apply with this game, and it’s a relatively simple affair for any gamer of any age to pick up, play, and thoroughly enjoy. But it doesn’t stay basic for long – if only because that would become hugely boring – and as you could probably imagine there are numerous little additions which see your time with the Doughlings go from simple breaking of bricks to high score leaderboard chasing and superpower collecting. Knocking the in-play ball back and forth between Morpheus and the constantly dropping infected Doughlings is the name of the game, as this sees the healing process take hold. With various levels of evilness to remove, a simple hit of a blue Doughling sees them healed, floating off in order to enjoy their life once more. However, the gasses that the crashed meteor has discharged has seen some of the population infected worse than others, and a green Doughling will need to be hit once and changed to blue, before being knocked again to safety. Yellow and red lifeforms need multiple taps of the ball in order to see them removed from the playfield; this colour changing mechanic is a decent idea which ensures that the well designed levels won’t be over in just a minute or two. With the removal of your Doughlings into the world again comes further opportunity. Thumbs up ‘likes’ drop from the sky on full healing of each little guy, and the collection of these will eventually see Morpheus able to utilise superpowers. 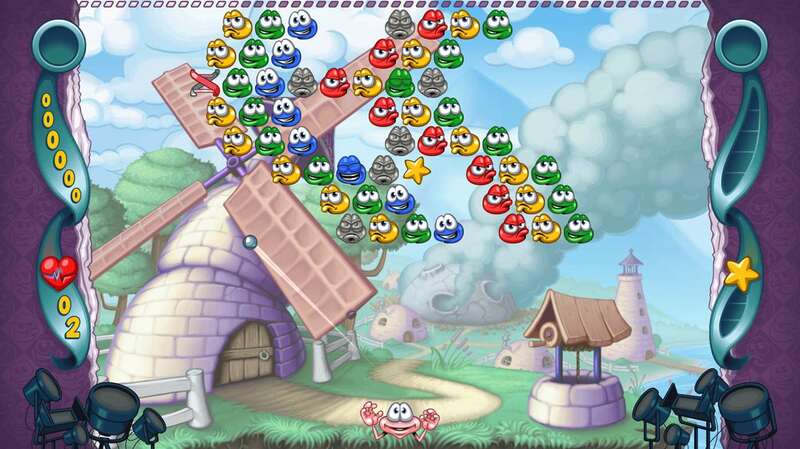 In its most basic form, obtaining 10 of these drops will bring into play the colour-ball, turning huge swathes of bad guys the same colour, grouping them together so that you can easily remove vast amounts with one hit. This is however just the start of the fun and games. See, once you get into things, moving through the 90 stages that are in place, you’ll also find DNA strands falling from the sky. These can be picked up in order to change Morpheus into one of six super powerful beings… all of which come with great skills attached. 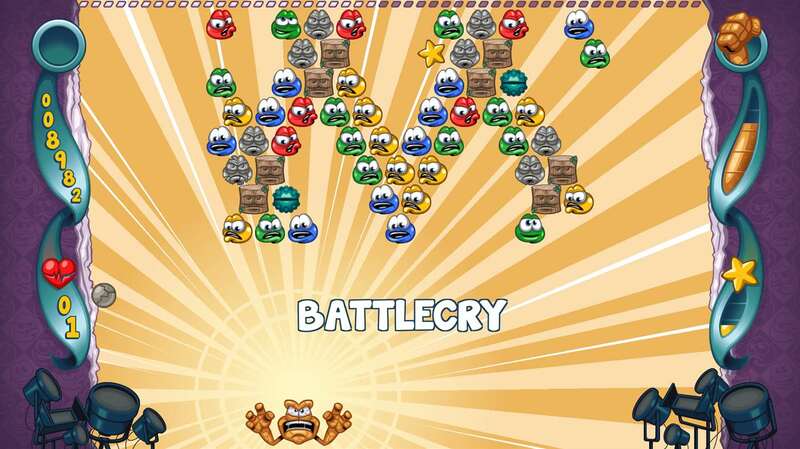 Smash for instance is a larger version of Morpheus, allowing an easier time with batting balls back, whilst his thunderclap special quickly rids the play area of Doughlings, whilst Bedrock will bring a bigger ball into play. Gunner allows you to shoot bullets high into the sky forgoing the need to be precise with your ball batting, whilst the likes of Robo magnetises the ball to the bat for ease of use, and Spook, well, spooks! By far the most exciting upgrade is that of Webster and collecting this DNA strand sees Morpheus turn into a proper full-on webslinger, firing out two balls at once, and stringing a safety web across the bottom of the playfield to bounce balls back into the action. All of the various abilities of each morph can also be upgraded – should you grab enough falling stars to unlock the required vials. It is the draw of these upgrades, and the skills that they bring, that ensure that even if you feel all is lost, with lives low and Doughlings aplenty to rid the world of, things can be switched round in an instance. Drop in the multitude of Achievements and Gamerscore additions that can be worked towards with each of the upgrades, and you’ll quickly see how Doughlings: Arcade gets so damn addictive. 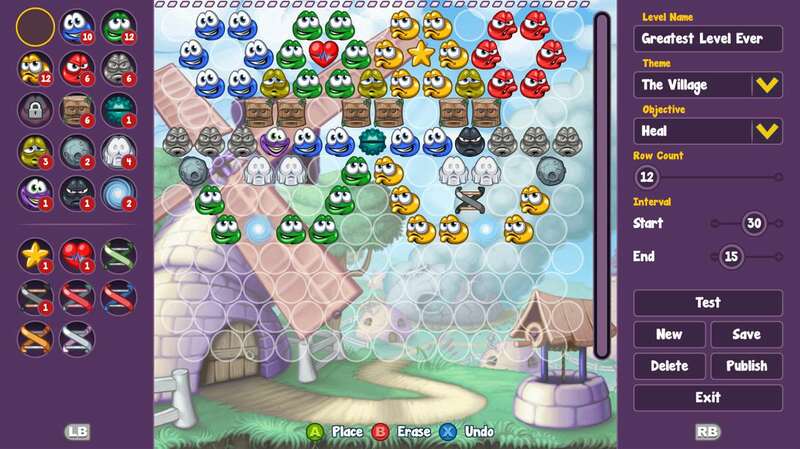 Normal, hard and secret bonus levels all play host to your time with Doughlings, with each delivering a different setup in terms of opponents to dispatch. With leaderboard places to chase, stars to grab for bonuses and little in the way of time restraints to really worry about, this really is a brilliant little brick breaker. And that is without mentioning the very impressive Level Editor which can see you creating stages of your own and publishing them for the global community to enjoy. It’s a cinch to use too and in no time at all you’ll have your own Doughling filled masterpieces going online. At the end of the day though, this is ‘just’ a brick beaker and that means Doughlings: Arcade isn’t going to be the most accomplished game you get to play in 2018. What it does do it does very well and aside from the odd dodgy hit mechanic that completely wrong foots you, the mechanics work well and the brilliantly bright visuals do the job intended. It has to be said though the stupidly annoying soundtrack that will worm its way inside your head from the very first instance isn’t particularly appealing. Each to their own on that though I guess. However, the sheer amount of content, and the low price that it comes with, should see anyone with even a hint of passion for the brick smashing genre give Doughlings: Arcade a shot. Chances are you’ll still be playing it a good few weeks down the line as you try and save Planet Doughling from utter destruction.